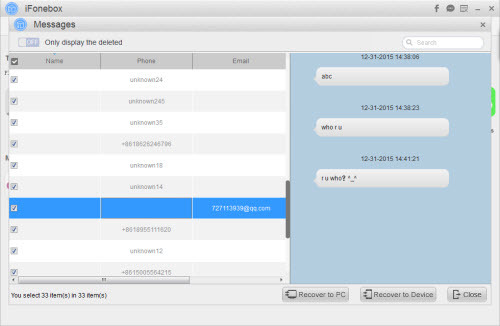 How To View iPhone Messages from iTunes Backup File? It is surely a good habit to back up your iPhone to your computer through iTunes and created an iTunes backup file. However, the iTunes backup file is not readable and it does not allow direct access to certain data like messages, contacts, notes or photos. Unless you restore your iPhone from the iTunes backup, there is no possibility for reading iPhone text messages. If you want to view the messages particularly from the iTunes backup, especially when your iPhone is damaged or simply not at hands, what should you do? Fortunately, there is a piece of iPhone data recovery software named iFonebox which is professional and fast at extracting all the text messages from your iTunes backup file selectively. No need to restore your iPhone, no need to worry about data overwriting. Just a couple of clicks, you will be able to access the text messages saved in the iTunes backup file on computer. > Choose Messages to scan and export selectively by clicking on the icon of Messages app from the interface listing all the supported data categories. > The data scanning and analyzing process may take quite a while if you have a large stock of messages on your iPhone. > After the scanning process is completed, all the messages will be exported and presented in a list. Please select the items you want and transfer to your computer by clicking on the button of “Recover to Computer”. How Do I View Photos From an iCloud Backup Without Restoring iPhone? This entry was posted in iPhone, iTunes, Messages and tagged iPhone, iTunes, read iphone messages from itunes, read iphone text messages, view messages from itunes backup by IosdroneD. Bookmark the permalink.